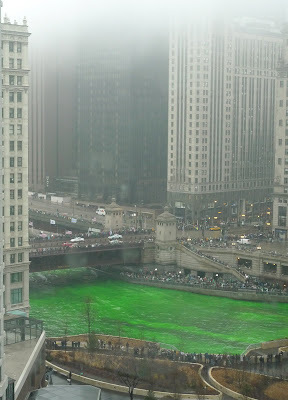 Saint Patrick's Day was technically yesterday, but the festivities started early in Chicago. This past weekend was the annual dyeing of the river. I requested that we go see it this year. It turns out we didn't even have to go outside, because you can see it from my friend's apartment. They never knew it was visible from their place this whole time. How many years have you guys lived there? Silly girls. =) It was raining and pretty cold outside, but there were a lot of people out. Next year we are going to go see the parade, but this year, because of the weather, we opted for brunch instead. We were debating whether to go to Billy Goat Tavern for their burgers, which is depicted in a SNL sketch that you can see here. 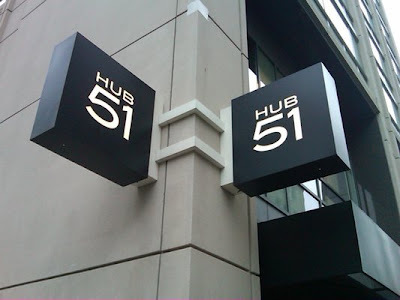 It's a Chicago icon so I will have to try it someday, but we decided to go to Hub 51 for some brunch food since we were craving breakfast food. It's a nice bar/restaurant close to where my friends live in downtown. I was a bit weary of the menu at first because they had regular brunch items like eggs and pancakes, but also sushi rolls and Mexican food for brunch. Anywhere that serves both sushi rolls and Mexican food on the same menu is just weird to me, but I was willing to try it. Again halfway through our meal, I got consumed with eating and forgot to take pictures. But I think the best thing we ate that day was the pulled chicken nachos, which I did take a picture of. It came with freshly fried chips (which was key! ), guacamole, salsa, cheddar and Oaxaca cheeses and sliced fresh jalapenos. The pulled chicken with the chipotle sauce was yummy and I loved that they gave you extra salsa on the side. We also ordered Blueberry Pancakes, a Denver Omelette and a Cheeseburger to share. The omelette didn't get our love, but the pancakes and the cheeseburger were good. Nothing spectacular, but decent. Like I said, the nachos were the best, so maybe I will try their Mexican food items next time. BTW, if you come in your PJ's, you get 10% off and 20% off if you're in your last night's outfit. Good to know for next time. chica!! can you make a post about Berry Chill Yogurt in Chicagoland (n. state street) and compare it to Pinkberry?! haha, girl, it's still too cold to eat Berry Chill, although there is one really close to me so I will try it soon and compare it for you. Is it more like Pinkberry or Red Mango?